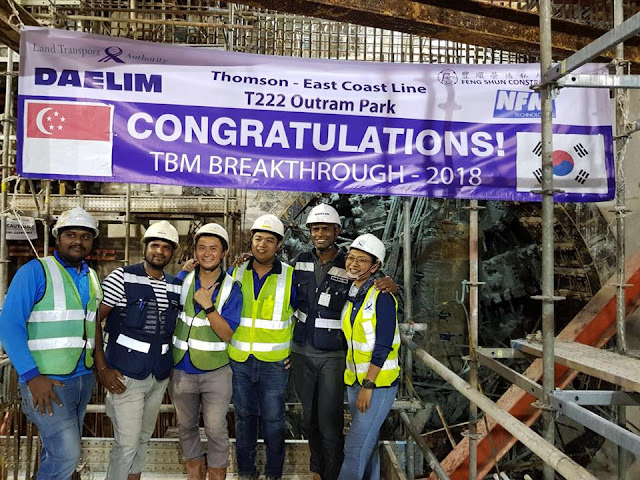 Tunnelling works for the T222 project have completed following the breakthrough of the third drive (TBM 1 refurbished) along the Woodlands Bound tunnel on Apr 27 and the fourth drive (TBM 2 refurbished) along the Changi Bound tunnel on Jun 21 between Outram Park and Havelock Station (800m). This is the final tunnel to be completed under the C4 team, and the second final project along the overall line to complete bored tunnel excavation works. Bored tunnel works for the T225 project completed in the early hours of today with the docking of TBM 2 at Maxwell station. Tunnelling works were unique in this project due to the stacked configuration of the 2 launch shafts, one of which is within the permanent structure of the station. 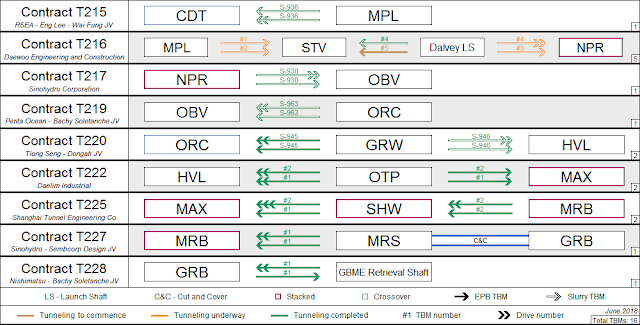 Geological constraints were also experienced beneath McCallum St resulting in prolonged delays and the eventual re-sequencing of the TBM drives. T225 is the 3rd last team to complete tunnelling works for the line, ahead of T222 later this month and subsequently T216 in Q4. 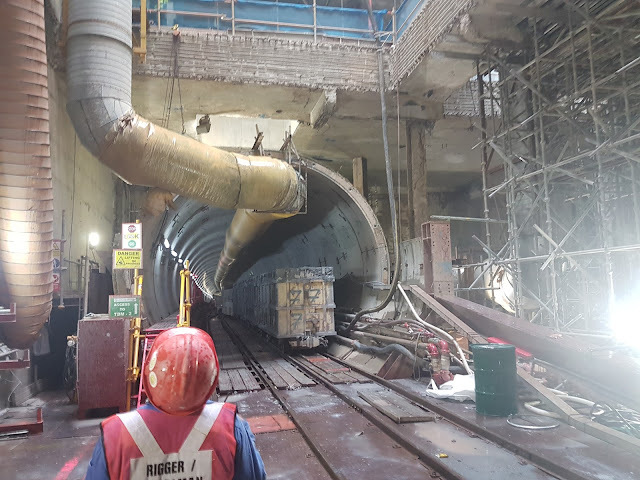 Assembly works for the final TBM for the Thomson Line (C1-C4) are in progress at the Dalvey Launch Shaft for the 300m Woodlands bound tunnel towards Stevens Station. The said TBM is a refurbished STEC Earth Pressure Balance machine previously used on the line which had been additionally procured by the project team in an effort to achieve the crucial basic structural completion for TEL3 by the end of the year. 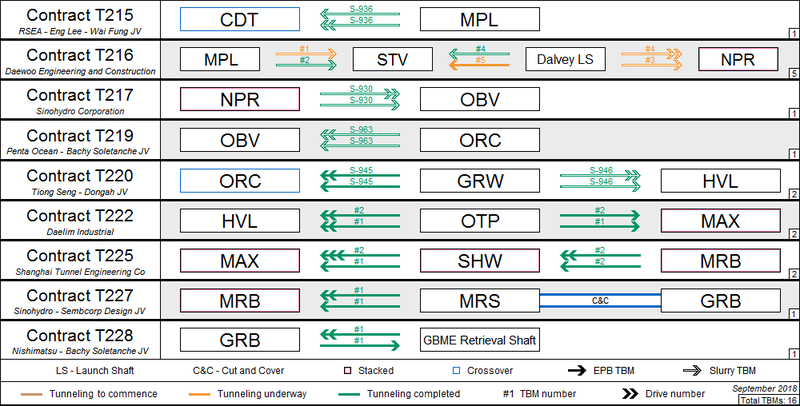 The 5th machine supersedes the intended second drive of the NFM TBM 3, which is currently still excavating the Woodlands Bound tunnel towards Napier. 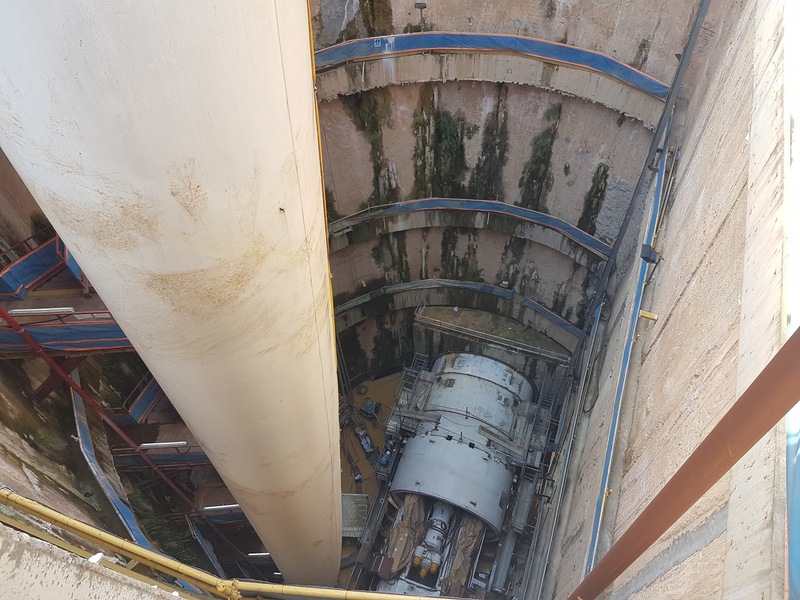 The choice of using an EPBM as opposed to the existing Slurry TBMs is likely due to the constraints for the Slurry Treatment Plant, which was designed to only accommodate concurrent tunnelling works for TBM 3 and 4. Favorable geological data obtained from the previous excavation of the parallel Changi bound tunnel likely bolstered the decision of using an EPB shield. The TBM was lowered down in the second week of May and is scheduled to commence mining next month.